Mary Pickersgill, was the maker of the Star Spangled Banner Flag hoisted over Fort McHenry during the Battle of Baltimore in the War of 1812. The daughter of another noted flag maker, Rebecca Young, Pickersgill learned her craft from her mother, and, in 1813, was commissioned by Major George Armistead to make a flag for Baltimore's Fort McHenry that was so large that the British would have no difficulty seeing it from a great distance. The flag was installed in August 1813, and, a year later, during the Battle of Baltimore, Francis Scott Key could see the flag while negotiating a prisoner exchange aboard a British vessel, and was inspired to pen the words that became the United States National Anthem. 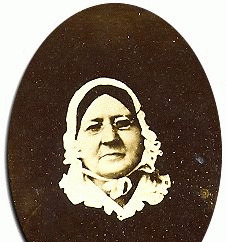 Pickersgill, widowed at the age of 29, became successful enough in her flag making business, that, in 1820, she was able to buy the house that she had been renting in Baltimore, and later became active in addressing social issues, such as housing and employment for disadvantaged women.